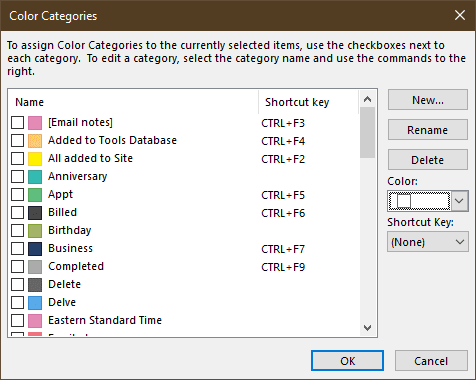 The color category shortcuts (Ctrl+Function keys) are fixed in Office 365 Version 1902 Build 11328.20146, released March 5 2019. If you reverted to an older build, check for updates. After installing the January 2019 Office 365 update, users discovered the category shortcuts (Ctrl+Function keys) either don’t work or apply the wrong category to the item. Microsoft is aware of the issue and it is expected to be fixed in an update in late February 2019. If waiting for the update is not workable, you can roll back to the previous build. First, you need to turn off updates, otherwise the bad update will be reinstalled overnight. It is recommended that you create an appointment on your calendar to turn updates back on in about a month. Use the following steps to install the older version in either 32 or 64 bit click to run. Right click on the Command Prompt, choose Run as Administrator. Copy then paste this line in the command prompt to go back to the Jan 14 2019 build. This will cause an update to start installing. It’s not necessary to reboot when it’s done installing. I just installed the latest Office 365 update and this problem has been fixed! The color category shortcuts (Ctrl+Function keys) feature for Outlook is back. Office 365 update is Version 1902 Build 11328.20146. Thank you! I haven't seen an update yet, have you?